Create time-lapse video of a construction site or other point of interest; share or publish time-lapse video online. 2. Does CameraFTP support time-lapse? 3. How does CameraFTP support time-lapse and what is the service price? 4. How can I connect my camera to the Internet (at a construction site)? Time-lapse is a technique where you take pictures at a very low frame rate and play them at a much higher frame rate. This way, the time appears to be moving much faster. Hence it is called time lapse. Time-lapse is often used for construction projects. You can setup an IP camera to automatically take a picture of a construction site every few minutes or every hour. When the construction project is finished, you can create a short time-lapse video showing the progress of a skyscraper or a bridge being built. Creating a short video of other (long) events, or point of interest. Yes. CameraFTP mainly offers cloud recording & surveillance service. We have the most flexible service plans. Users can fully customize their service parameters (such as image/video recording, resolution, frame rate, retention days). Because of this advantage, CameraFTP can easily support time-lapse! In fact, we have a lot of users using our service for time-lapse. The cost is very low. It is very similar to regular cloud recording service. First of all, you need an IP camera (usually an outdoor camera) that is connected to the Internet. You can then configure the IP camera to upload images to CameraFTP using FTP or SMTP. For more info about how to configure IP cameras, please visit our supported cameras and camera setup guide page. 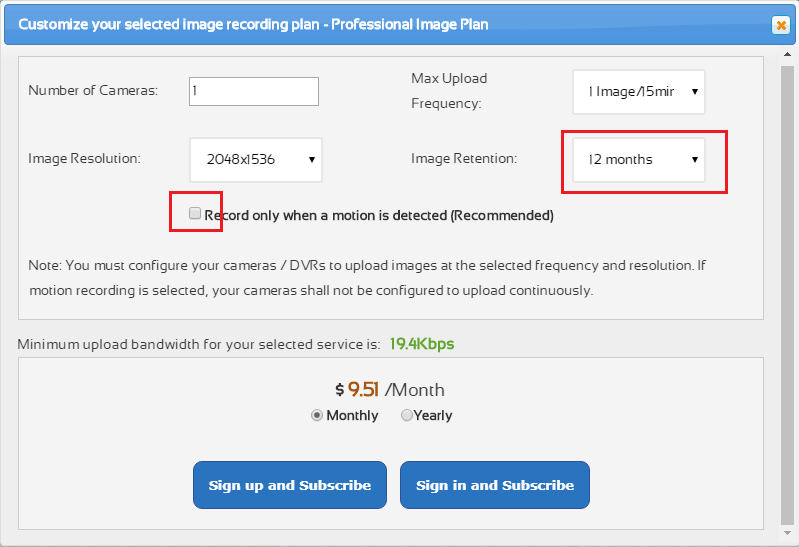 For time-lapse service, you need to order an image recording plan with very low upload frequency, such as 1 image/15 minutes or 1 image/hour. Don't select motion detection as you want to record continuously at the specified frequency. The image resolution is dependent on your quality requirement and your camera capabilities. For large construction sites, usually you need very high resolution images. It is recommended using the highest resolution that your camera can support. (e.g. 4MP, 6MP or even higher). Lastly, select a retention time that is at least as long as your estimated project time. If your scene is small, you can use a lower resolution, e.g. if you want to create a time-lapse video of a small plant growing, you can set it to 1 MP (1280x800). As shown above, the price is very low, e.g. for a 1-year (construction) project, if pictured at 1 image/15 minutes continuously, at 3MP resolution, the price is only $9.51/month. You can save 2 months if you order annually. You can search online for "mobile 4G broadband router" to find a lot of such devices. Make sure to buy one that is compatible with your mobile service. Most mobile 4G broadband routers support both wired and wireless Internet connection. You can connect multiple IP cameras to the same router. This way, you have more camera options. If you need multiple cameras, you can save cost on both cameras and mobile data service. Time-lapse service usually does not require a lot of bandwidth. But the Internet connection must be reliable. For 1 camera uploading one 3MP image every 15 minutes, the average upload bandwidth requirement is only about 20Kbps. It can easily support quite a few such cameras with only one mobile broadband router. In fact, if 4G LTE is not available, 3G service is also fast enough to support 1 or 2 such cameras, assuming the signal is strong enough. The mobile data service price is dependent on your mobile operator and your data plan. With the above parameters, each camera is estimated to upload 2 to 6 GB of data/month. 6. Can I share/publish the time-lapse video before/after the (construction) project is completed? Yes. CameraFTP's time-lapse service is a (special) Cloud Recording/Surveillance service. To share / publish a camera, you just need to log on to www.CameraFTP.com, go to My Cameras page, then click the Share or Publish icon below the camera thumbnail. Your users can view the live camera (with some delay) and play back the recorded footage. If you publish a camera, not only can it be added to CameraFTP's Published Camera Gallery, you can also embed it in your own website / webpage. For more detailed info about publishing, please visit the Publish Support Page. After the (construction) project is finished, the recorded images could be deleted based on the retention time. If you don't want to lose the images, you can download them using any FTP client software such as FileZilla, or you can back them up to DriveHQ.com cloud storage. Time-lapse service is not a security & monitoring service. Because the upload frequency is very low, it will miss a lot of motions/events. (It can still be used for "keeping an eye on something"). Because of low upload frequency, time-lapse service usually can only record images, not videos. (CameraFTP Viewer apps can play the recorded images like video). Cloud recording (and home/business security) service usually has a much shorter retention time. Due to the high upload frequency, it will use a lot more storage space for the same amount of time. Time-lapse is almost always used for outdoor scenes.